If you want to put those hard earned guitar skills to use in Rock Band 3, you're going to need ever-so-slightly deeper pockets than everyone else. There's a price you pay for being a guitar virtuoso. Ordinarily, it's a more nebulous fee made of up determination and effort, but when it comes to Rock Band 3 it's a little simpler, coming it at a buck per song. Rock Band 3's Pro Mode gives players a more realistic experience playing the songs than the regular mode does, but according MTV Games Paul DeGooyer, creating the Pro Mode guitar parts takes much longer than for any of the other instruments. That was why, he said, the decision had been made to sell the Pro Guitar parts separately. Each song will cost $1.99 and will include the regular gameplay modes, plus the pro modes for every instrument bar the guitar. If you want the Pro guitar part as well, the price for the song increases to $2.99. DeGooyer said that he thought that the price was fair, and better than the alternative, which was to include the pro mode guitar in all DLC and just increase the price for everyone. He also noted that not every song was complex enough to warrant a Pro Mode guitar part. 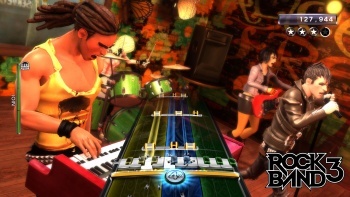 When it comes to adding in Pro Mode content and keyboards - the new instrument that Rock Band 3 is introducing - to previously available songs, DeGooyer said that the costs hadn't been finalized, but that a major artist with DLC already available would be getting retrofitted with the new content, as well as a healthy cross section of other songs. Rock Band 3 will be available on October 26th.